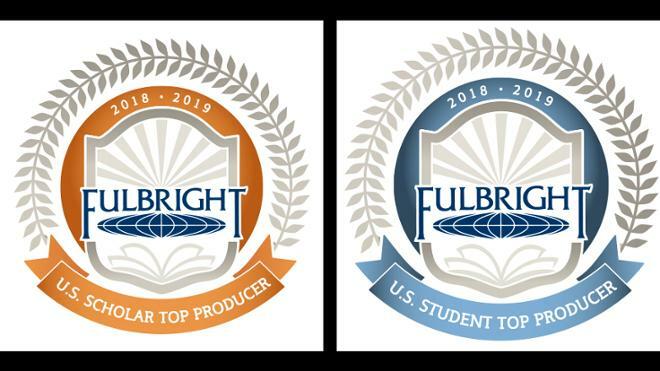 Two scholars and eight students received Fulbright awards in 2018-19. Biology professor Jory Brinkerhoff and history professor Manuella Meyer received Fulbright awards to support their research projects. Brinkerhoff, a disease ecologist who studies parasites, has been collaborating with colleagues at Nihon University in Japan to analyze Bartonella parasites found in Japanese macaques. Meyer, a historian who examines the socio-political and medical terrain of mental illness in Rio de Janeiro, has been working on her second book project. Learn more in this media release. UR’s eight student Fulbright recipients have been completing a range of opportunities from teaching English in Germany to researching ecology in Uruguay to continuing education at the London School of Economics. Learn more in this media release. “These opportunities fuel the intellectual and personal development of our Fulbright students,” said Crutcher. The Fulbright student competition is administered through Office of Scholars and Fellowships. The Fulbright Scholar Program is supported through Foundation, Corporate, and Government Relations.